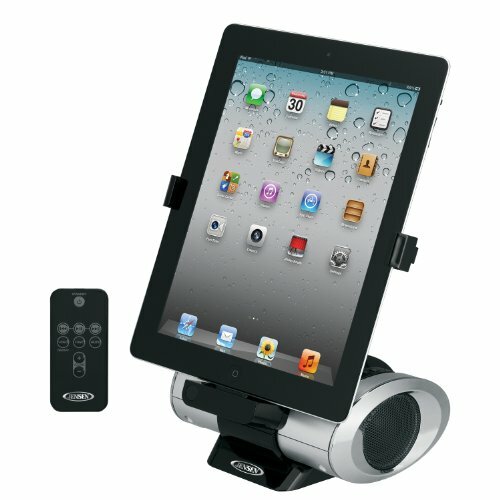 Docking stations are the ultimate convenience for any iPad owner. 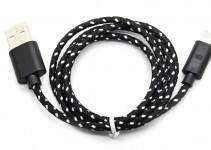 They charge your device while keeping pesky, tangled cords out of the way. Docking stations often include extra features like alarm clocks, sound systems and USB ports to charge more than one electronic device, giving them multiple uses in your home. Today, iPad docking stations are becoming a fixture in more and more homes. There are many types of docking stations with different features included. Here are the top ten best iPad docking stations available on the market today. 6. Ipega 2-in-1 Speaker and Charger Dock Dual channel audio output. Phillips designed this docking station as an all-in-one nightstand system. It’s part docking station, part sound system, part alarm clock, part radio with a speaker that delivers great sound. It has a unique alarm clock setting that can wake up two people at different times and can also preset different times for different days of the week. 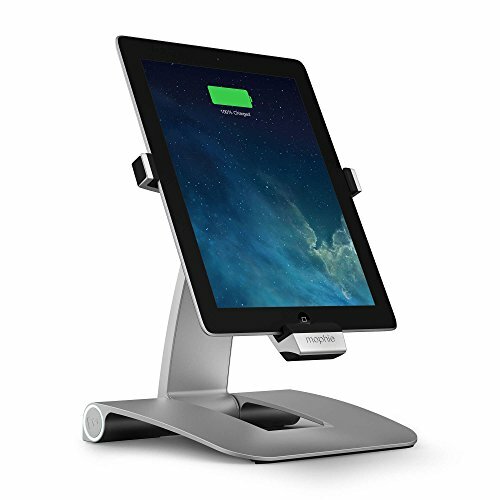 This docking station has an additional USB port in its back that allows you to charge your phone along with your iPad on the charging dock’s lightning connector. There’s no other docking station out there that does it all quite like this system from Philips. 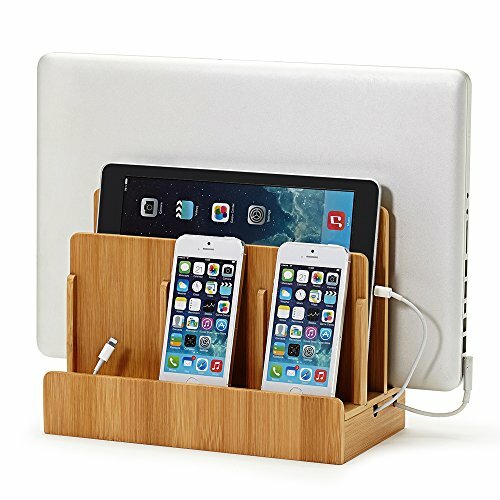 Perhaps the best looking iPad docking station available on the market today, this eco-friendly bamboo model from Great Useful Stuff will pour the style onto your devices during a charge. 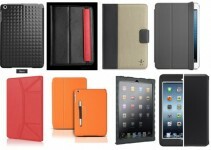 The middle divider is designed to keep any sized iPad fully charged. Ideal for families or communal rooms, this dock holds up to three smartphones in its front layer and a MacBook in its tallest back divider. The bottom layer of the dock keeps charging cords out of sight and untangled, giving this bamboo dock an even cleaner look. Instead of using plastic or aluminum for its body materials, G.U.S. chose a rapidly renewable bamboo material, making this the most eco-friendly choice for an iPad docking station on any tech list. This docking station is certain to turn up the aesthetic in your home or office while saving the environment with one small step. Streamlined and simple, this docking station from Mophie is a no-fuss way to charge any 4th Gen iPad. The iPad stand rotates a full 180 degrees to fulfill great views at every angle. This is the perfect docking station to consider if you like to watch your favorite movies or television shows on your iPad but worry about the power running low. 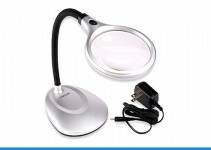 It’s made of clean, durable aluminum and adjusts to multiple heights during use. This portable docking station from Jensen comes with two speakers and remote so you can DJ from across the room while you charge your iPad. The remote makes this Jensen docking station a great choice if you’re planning to use your docking station while entertaining. It has two arms at its sides that keep your device standing upright while charging and jamming, making it easy to scroll through new songs on its screen during use. The arms are adjustable, allowing you to turn your iPad vertical or horizontal. The rotating dock is handy for use when typing on your iPad horizontally. UNITEK’s docking station is the ultimate option for families or offices with lots of devices. 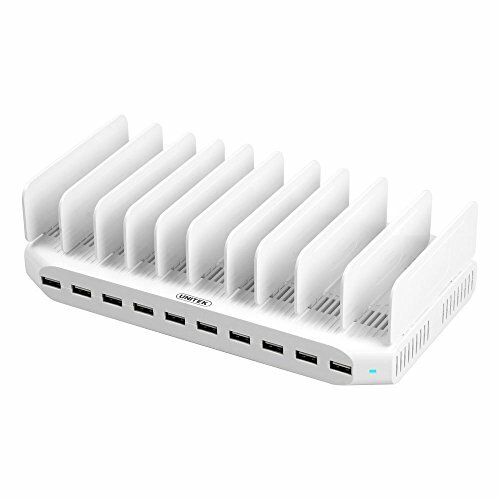 Fit with 10 USB ports, this station can charge 10 different devices at once. Contrary to what you may think, this model doesn’t take up much space while charging 10 different devices. With dividers between devices, this charging station keeps everything standing upright while charging. It has a unique temperature-detecting overheating preventive technology to stop devices from overheating while charging. If overheating occurs when using this docking station, the device will cease charging. This docking station is a clean, organized method to supply power to every device all at once while cutting down on space. This sleek docking system from Ipega charges your iPad and iPhone simultaneously. It includes two lightning connectors so it keeps both devices standing upright during a charge. There’s a small speaker in its rear that really cranks up loud—over 70 decibles of sound—so you can blast tunes from your iPad or iPhone. The dock also includes control buttons along its front panel for easy song and volume selection. The docking station arrives in a shade of red that turns up the fun in any room. Also called the Jensen Rocker, this iPad docking station is one of the most portable on the market fit with a speaker to pump out the jams. Its arms hold your iPad upright for easy access to the screen to select apps and music while charging and playing. This docking station has volume buttons along its front panel, making it easy to access the controls you need in order to crank up your favorite songs. It can fit in a bag for easy portability to enjoy the speaker technology away from the home or office. With upholstery inspired by black pebbled PU leather, this is a luxe-looking docking station without the luxe price tag. If you’re an Apple Watch user, you’ll love JinSun’s special soft stand with cable cut out for the watch to charge on this docking station next to your iPhone and iPad. While it does not include lightning connectors or power cables of its own, the JinSun docking station has holes for your device’s chargers to feed through, keeping your cables organized during use. 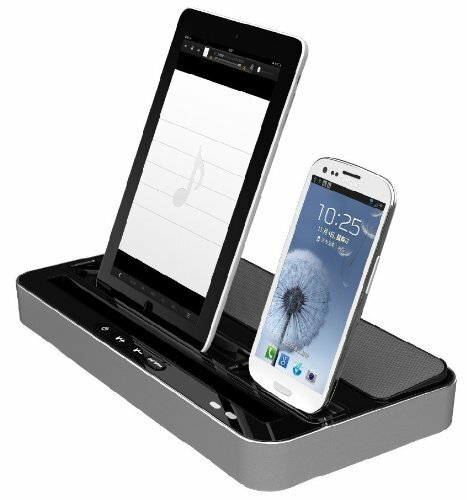 This docking system is the perfect addition to any nightstand or desk. When not in use, it resembles a classic storage tray more than a docking station. This compact speaker docking station system from iHome packs a punch. It charges your iPad, iPhone or iPod while playing your favorite tunes through its two generously-sized speakers. Enhanced with SRS TruBass and Reson8 sound technologies, you won’t want this system to leave your side once you turn up the volume. It’s battery-operated, making this docking sound system completely portable. When not in use, this iHome model has a cover that slides over the lightning connector and speakers to protect against dust. Plus, iHome was one of the first technology brands to begin manufacturing docking systems when Apple first released the iPod onto the market, making iHome an extremely dependable and reputable brand in the world of docking systems designed particularly for Apple products. 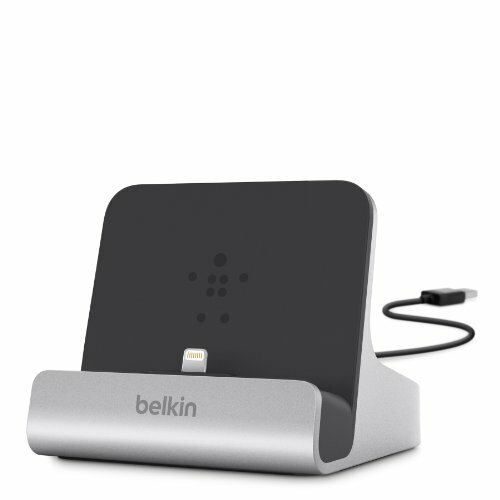 This aluminum-plated docking station from Belkin adds a clean look to any room while charging your iPad, iPhone or iPod. The connector props your iPad up for use during its charge. The lightning connector on this dock is completely adjustable to fit multiple models of Apple products and is tall enough to fit around an iPad’s protective case so you don’t have to remove it before charging or syncing. Once the iPad is set, the connector turns left and right for easy use during the device’s charge. Using the included 4 foot USB cable, this dock lets your iPad sync with your MacBook or other Apple devices while charging. The dock can take power from a wall adapter or from a computer by plugging into either power source. This docking system has a compact, streamlined design that can fit among any room’s aesthetic without overtaking space. It’s a great choice if you use multiple Apple products in your everyday life that require overnight syncing.